5330 ✉ 4,DR56a 20 Pfg. Crown / eagle with overprint \"TOGO\" in mixed franking with German Reich 10 Pfg. 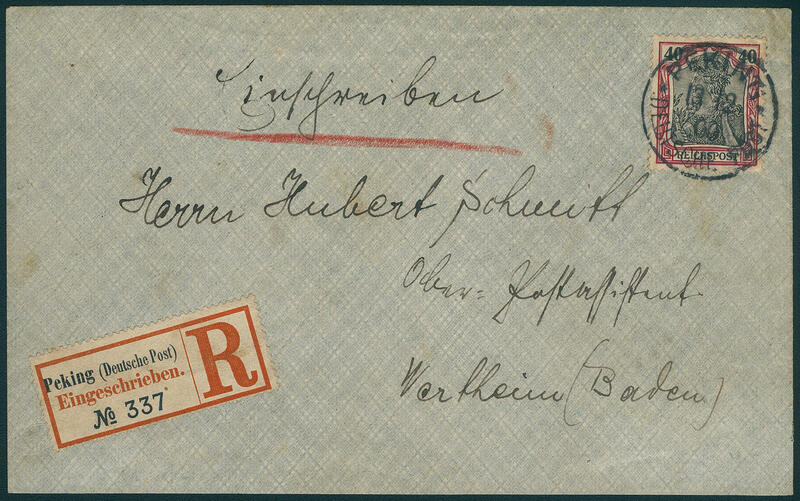 Germania-Reichspost, both values fresh colors, slightly round corner with clean single circle postmark \"small bum 17.2.01\" on commercially used registered cover (receiver name deleted) at a Mission house in Kaldenkirchen with arrival postmark. A very attractive cover with this in that specific commercially hardly to be found franking combination! 5331 15I 80 Pfg. 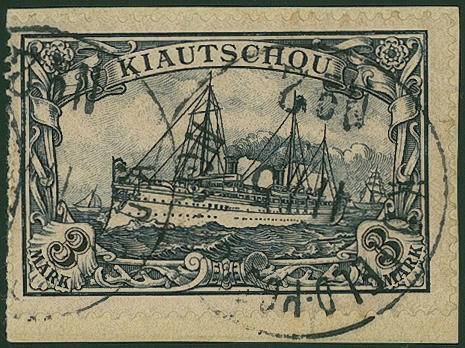 Ships with scarce plate flaw \"line under right indication of value 80 through spot interrupted\", fresh colors and in perfect condition mint never hinged, photo expertize \"faultless mint never hinged condition\" Jäschke-Lantelme BPP. 5332 15I 80 Pfg. Imperial yacht with plate flaw \"line under right indication of value 80 through spot interrupted\", fresh colors and in perfect condition unused. Michel 250,- €. 5333 ∆ 19 5 Mk. Green black / brownish carmine, wonderful fresh colors and well perforated on magnificent white letter piece, centric clear and turning into cancelled \"AGOME PALIME 6.9.06. \". An exception copy for your highest requirements! Photo expertize \"faultless condition\" Jäschke-Lantelme BPP. 5042 ∆ 37eV 2 Mk. 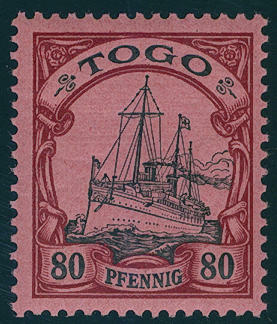 Dark red crimson in the horizontal strip of five, the second stamp from right with plate flaw \"large interruption the guilloche lower left\" with 5 Pfg. Opal green and 50 Pfg. Bright red brown, in perfect condition on beautiful parcel card coupon, neat cancelled \"SHANGHAI 22.4.97\". A decorative franking with the good plate flaw! Photo expertize \"faultless condition\" Jäschke-Lantelme BPP. 5043 ∆ 37f 2 Mk. Reddish carmine, fresh colors and very well perforated on very nice letter piece, tiny crease, perfect and neat cancelled \"Beijing German post 20.5.01\". Scarce use in the Petschili time! Expertized Bothe BPP. Michel / Dr. Steuer 1800,- €. 5072 ∆ PVaa/e 3 Pfg. 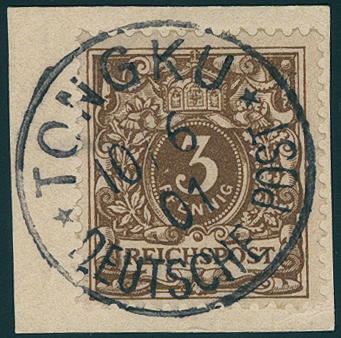 Crown / eagle in the good colour dark ochre brown as Petschili use on beautiful letter piece with all perfect, pricked clear single circle postmark \"TONGKU German post 10.6.01. \", which on of this issue rare occurs, in utterly perfect condition. An exception copy for the highest standards! Photo expertize \"faultless condition\" Jäschke-Lantelme BPP. 5073 ∆ PVae 25 Pfg. 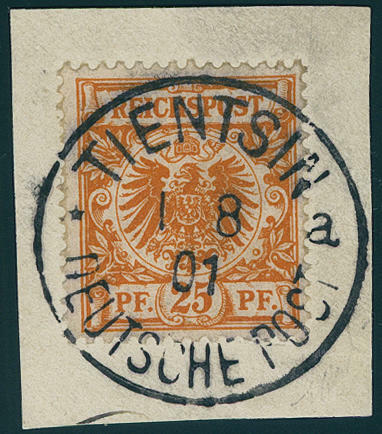 Crown / eagle yellowish orange, wonderful fresh colors and well perforated on magnificent white letter piece, all perfect used \"TIENTSIN German post 1.8.01. \". There are only few examples from this known, whereby it be here about of an of the most beautiful known pieces act. For the highest standards! Photo expertize \"faultless condition\" Jäschke-Lantelme BPP. 5074 ✉ PVb,AU13B 10 Pfg. Crown / eagle, postal stationery cover as extremely rare Petschili use in mixed franking with 5 Pfg. Germania-Reichspost twice as Petschili use and 20 Pfg. Germania with China overprint correctly franked as registered with single circle postmark \"K. D. FELDPOSTEXPED. Of the East Asian EXPEDITIONSCORS b 8.6. 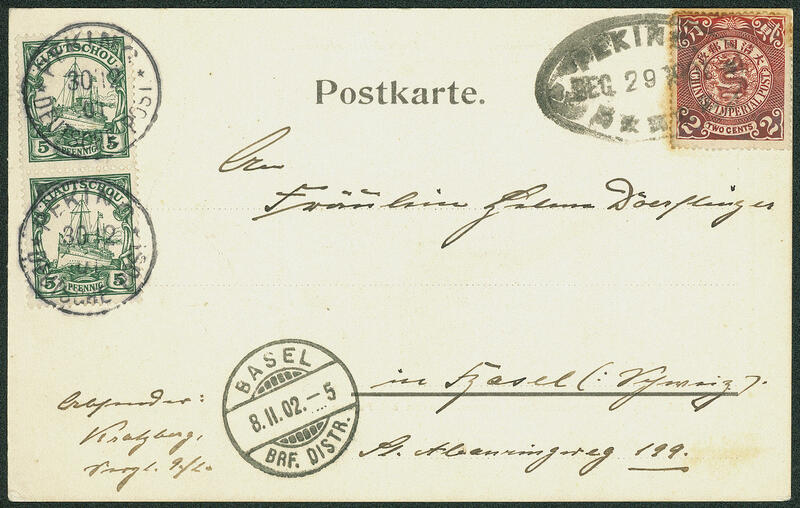 (1901) \" to Germany with arrival postmark \"GERA 22.7.01. \". 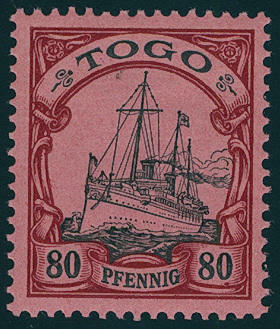 All stamps are fresh colors and in perfect condition, the cover with as usual, practically irrelevant traces of usage. As mixed franking of three different issues a major rarity the Petschili time! Photo expertize Jäschke-Lantelme BPP. 5075 ✉ PVe 30 Pfg. 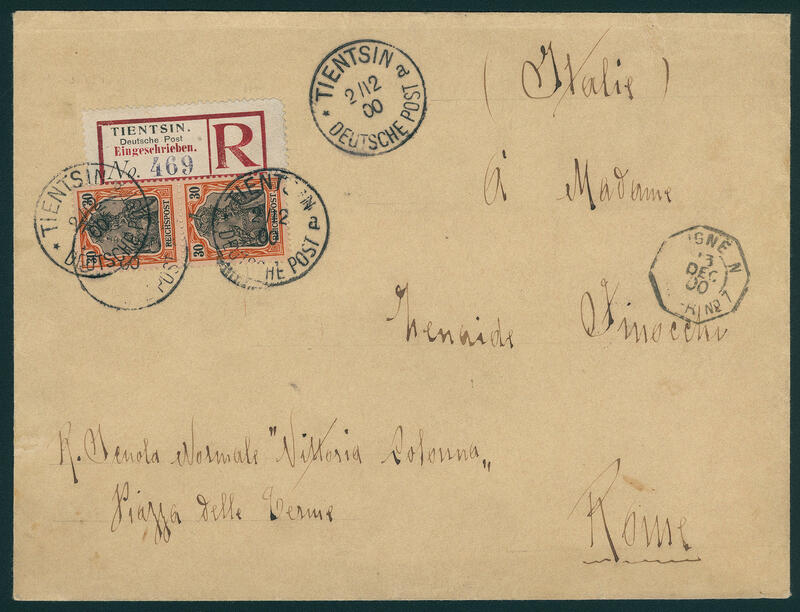 Germania, vertical pair, fresh colors and in perfect condition as very nice correctly franked multiple franking on registered cover with scarce provissional registration label from \"TIENTSIN 2.12.00\" to Rome / Italy with transit and arrival postmarks. 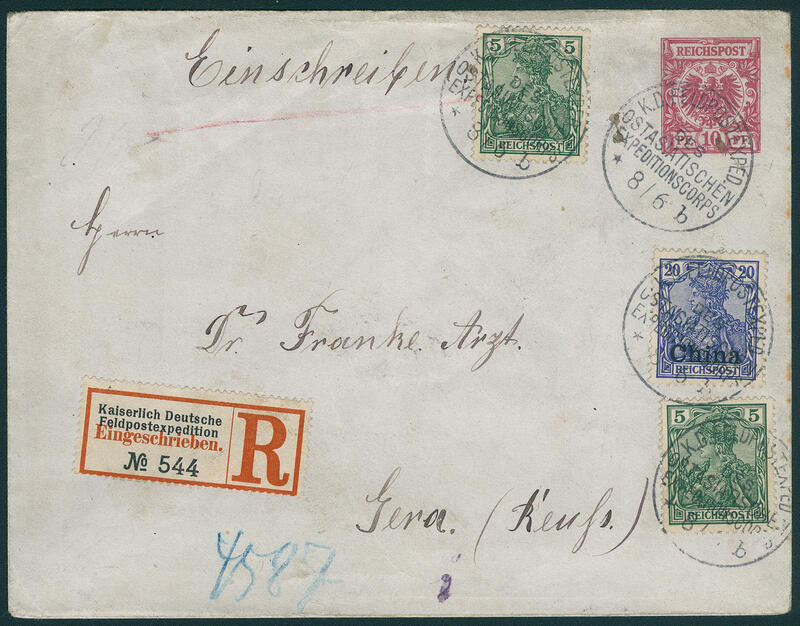 A particularly beautiful Petschili multiple franking abroad associated with the rarely registration label (Einfeldt type V). A rarity in outstanding condition! Photo expertize Steuer BPP. 5076 ∆ PVf 40 Pfg. 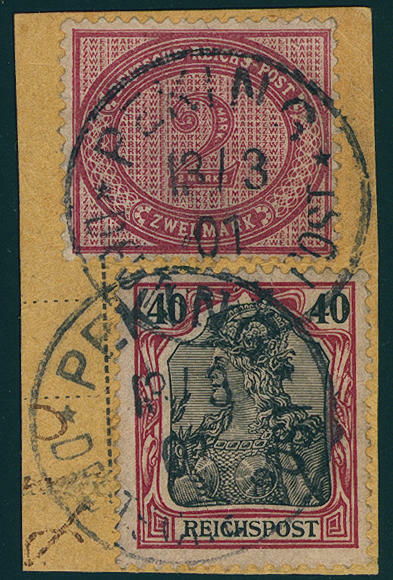 Germania as Petschili Provisional arrangement in mixed franking with 2 Mk. Dark red crimson as scarce combination on parcel card coupon, fresh colors and in perfect condition with clean single circle postmark \"Beijing German post 13.4.01. \". A very nice mixed franking in outstanding condition! Photo expertize Steuer BPP. 5077 ✉ PVf 40 Pfg. 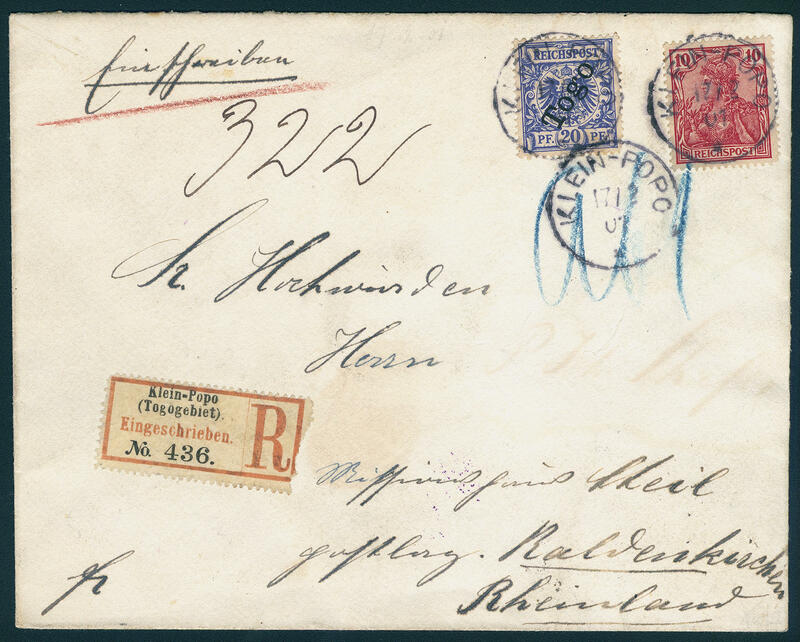 Germania-Reichspost, fresh colors and in perfect condition as scarce correctly franked single franking on especially beautiful registered cover with perfect single circle postmark \"Beijing German post 13.12.00. \" to Wertheim / Baden with arrival postmark. So nice single frankings of this stamp are very rare! Expertized Bothe BPP. 5078 ✉ PVIb 5 Pfg. 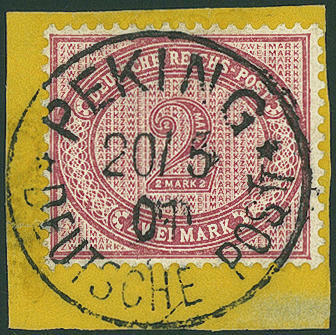 Petschili Provisional arrangement, ship issue, vertical pair, fresh colors and in perfect condition on picture postcard with neat postmark \"Beijing German post 30.12.01. \" in double postage with China 2 C., blotched, with oval cancel \"Beijing 29.12.01. \" to Basle with arrival postmark. An interesting and scarce combination! 5079 ∆ PVIm 3 Mk. Violet black, the scarce Petschili Provisional arrangement on telegram part with neat postmark \"fieldpost station office number. 2 (Beijing) \", in perfect condition. A very nice copy of this rare issue! Photo expertize Steuer BPP. Michel 3800,- €. 5080 ✉ 55 \"imperial German shipÂ´s mail steamer CREFELD\", very scarce provisional, private produced cancellation on picture postcard with 5 Pfg. Germania (Michel no. 55). These cancellation was to entrance of the navy shipÂ´s mail stamp used and is on documents rare to find. 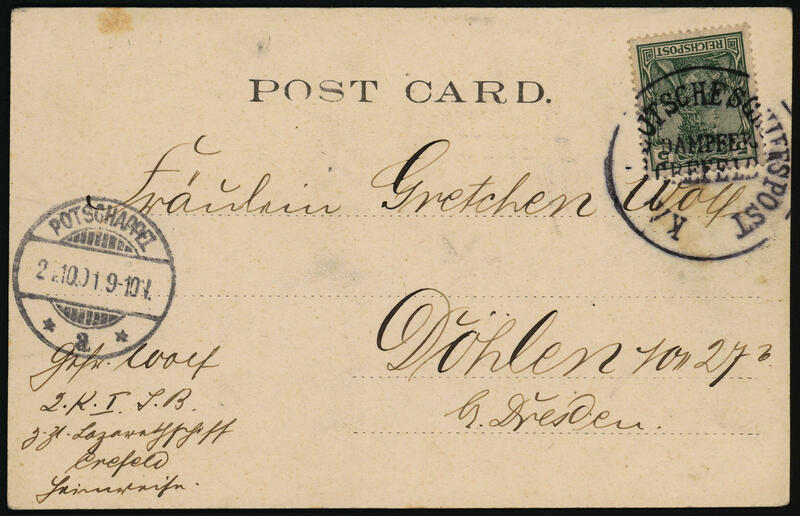 The card is to Döhlen by Dresden used with arrival postmark \"POTSHAPPEL 24.10.01\". Photo expertize Eichele. 5081 ✉ \"K. D. Fieldpost station office No6 1 / 6 (1901) \" clear on three sided opened fieldpost letter with additional rectangle cancel \"S. B. OSTAS. EXPED. II. BAT. 4.1 NF. RGMTS. 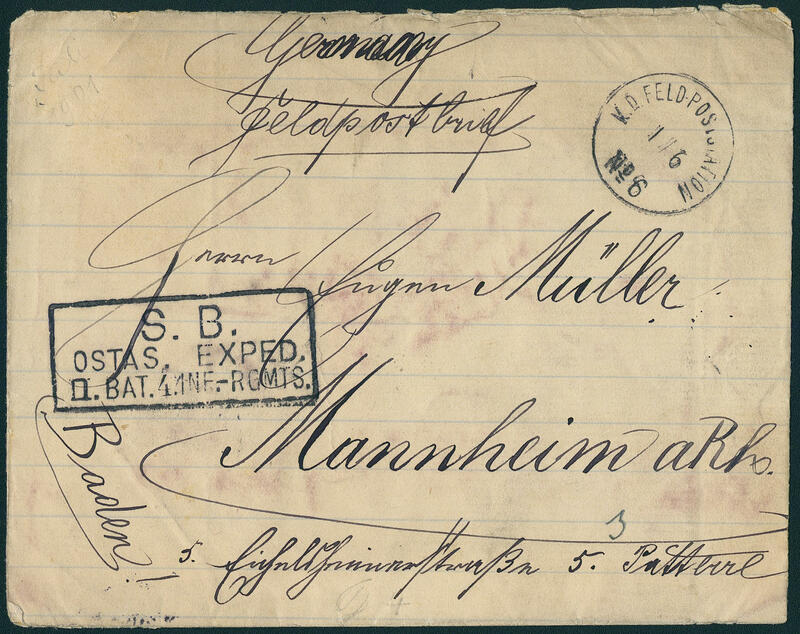 \" to Mannheim with arrival postmark. 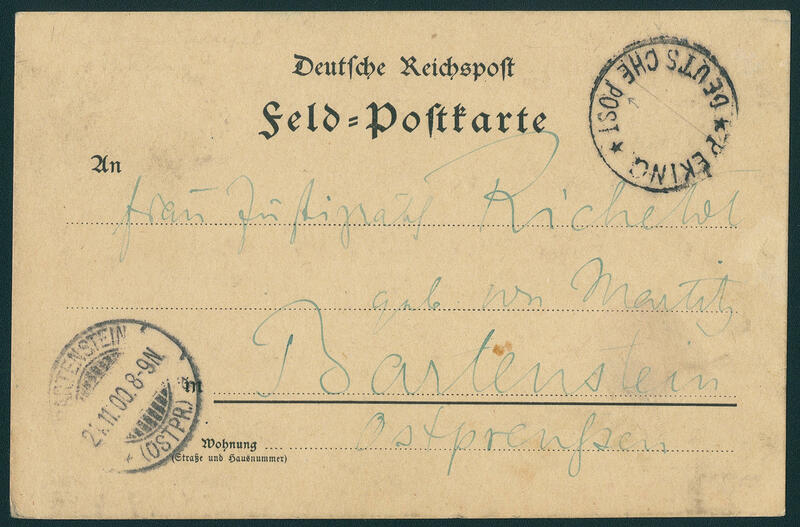 It is a matter herewith about the rarest fieldpost cancel of the German post in China. By almost all known documents is a fieldpost card. Fieldpost service letters with this cancellation are nearly unknown and to class among the large rarities of this area! 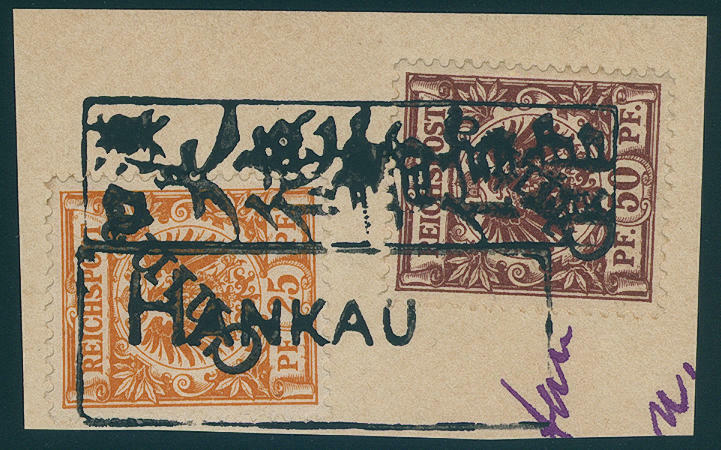 5082 ∆ \"HANKAU\", rectangle cancel with additional rectangle cancel with Chinese text (dateless) razor-sharp on magnificent letter piece with 25 Pfg. Diagonally and 50 Pfg. Steep overprint. An outstanding quality of this rare cancellation! 5083 ✉ \"ITSCHANG 30.11.05\", twice clear on very nice commercially related picture postcard with horizontal pair 2 C. On 5 Pfg., correctly franked to Berlin with arrival postmark. 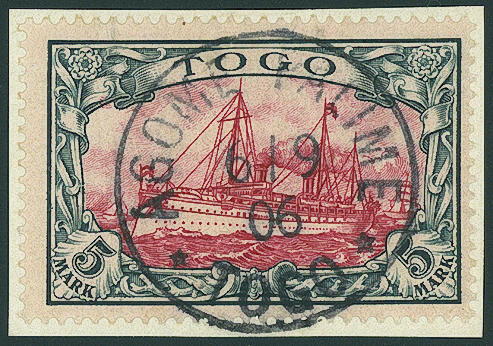 Commercially related documents with this stamp are very rare! 5084 ✉ \"Beijing imperial palace\", the scarce large rectangle cancel neat and clear on very nice fieldpost card with single circle postmark \"K. D. FIELD postal service station No. 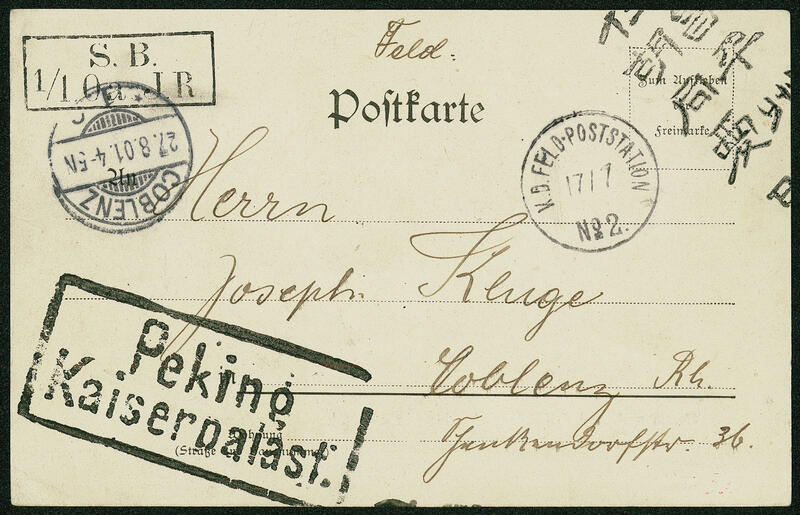 2 17 / 7 (01) \" to Coblenz with arrival postmark. The picture postcard shows the summer palace of the emperor from China close to Beijing. So nice cards with the sought-after postmark from imperial palace are extraordinarily rare! 5085 ✉ \"Beijing German post\" the scarce hardwood cancel dateless clear on faultless commercially related fieldpost card with a lot of text, written at the 6. 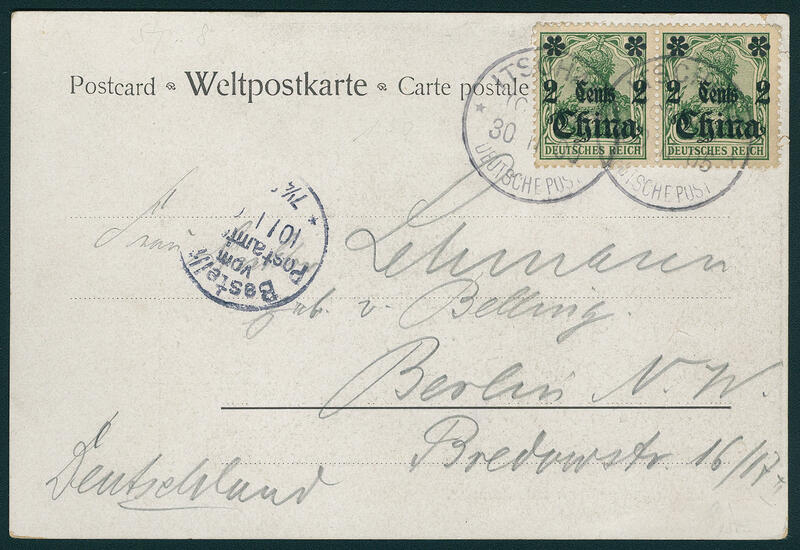 Oct 1900 in Beijing, to Bartenstein / East Prussia with arrival postmark. Regular transported documents with this rare postmark to class among the rarities of the Boxer Rebellion. Photo expertize Steuer BPP.